Nothing matches the crisp, fragrant blossoms of Paperwhite Narcissus for their ability to banish the winter doldrums. It is a Daffodil that is easily grown indoors in a pot or vase. Soon after planting, Paperwhites throw clusters of sweet, musky-scented, white flowers above slender, blue-green leaves in a cheerful display that lasts about five weeks. And if you plan it right, planting bulbs at 2- to 4-week intervals, you can have a staggered series of blooms throughout your home from Thanksgiving until spring (and still not break the bank). We're pleased to offer two varieties of Paperwhites in several handsome, yet understated presentations -- the better to complement the exquisite flowers. Varieties include the popular Narcissus 'Ziva', which produce more bloom than you've ever seen on a Paperwhite, and a recent introduction, 'Ariel', a floriferous, earlier bloomer that is the slightly more-compact grower of the two. Both have the classic, sweet Narcissus scent that makes spring almost tangible. It's an ancient Chinese custom to force Paperwhites in a bowl of water and gravel, and we offer kits for this purpose as well as bulbs for your own containers. Our new arrangement, Winter Solace, pairs 'Ariel' with several bold, red-berried stems of Winterberry Holly (Ilex verticillata) in a glass hurricane vase. The Essential Black Bowl is exactly that -- and it's stunning filled with 12 blooming 'Ziva' bulbs. New this year, we offer 24 extra-large 'Ziva' bulbs packed in our signature hardwood gift box. Paperwhites require no preparation and are absolutely foolproof. When bulbs are planted in early December, they will flower in 4 to 6 weeks with seldom a miss. Bulbs may be held for weeks in a warm, dark closet, which allows plenty of flexibility in orchestrating displays for holidays or other special occasions. We ship Paperwhites from September into January, with an occasional pause for foul weather. Paperwhites require little more than to be potted and watered to produce clusters of fragrant blooms. When the bulbs arrive, open the bags immediately to allow air to reach the bulbs. You can either pot them right away or store them at room temperature in a dark place for up to 4-6 weeks. Consider potting 6-12 bulbs at 2- to 4-week intervals for a staggered display. Bulbs usually bloom 4-6 weeks after potting. Paperwhite Narcissus will grow and bloom with nothing more than water and stones or beach glass. To "plant" your bulbs in any of our soilless kits, begin by carefully placing a layer of stones or glass to a depth of about 2 inches in a small vase or about 4 inches in a larger vase. Next place a layer of Paperwhite bulbs close to each other, roots facing down. Put a few stones or pieces of beach glass around and between the bulbs to anchor them in the vase. Leave the tops of the bulbs exposed. Finally, add water until the level reaches just below the base of the bulbs, but no higher (if the bases of the bulbs sit in water, they will rot). If you have received our kit with Winterberry stems, add them to the vase, placing the bottom of the stems in the water. To pot the bulbs from one of our kits with potting mix, begin by placing the potting mix in a plastic tub. Slowly add water and stir until the mix is moist but not soggy. Add moistened mix to the accompanying container until it is about full. Set the bulbs, pointed end up, on top of the mix. Space the bulbs very closely; they should almost touch. Then add more mix, covering the bulbs up to their necks and leaving the tips exposed. Water thoroughly. Rooting and care: Set your container or vase in a cool (50-60°F is ideal) place away from direct sunlight. Check the bulbs frequently and water thoroughly when the potting mix is dry one inch below the surface (but not more than once a week until the bulbs begin active growth), or when the water level is more than an inch below the stones or glass in your vase. If your bulbs are in a bowl (a pot without a drainage hole), water with extra care: Bulbs sitting in soggy pot ting mix soon rot. Once a week, tug gently on the bulbs to see if they have begun to produce roots. When your tug meets with firm resistance (usually about 3 weeks after potting), move the container to a sunny window. Keep a close eye on watering. Bulbs in active growth can dry out in just a day or two. When Paperwhites are forced to bloom indoors, they have a tendency to topple when in flower. Hold them upright with the bulb supports supplied with our bulb kits or with bamboo stakes and twine (available at garden centers). If you use our supports, set them in place when the bulb shoots are 8-10 inches tall by inserting the legs at regular intervals along the inside edge of the container. As the leaves and stems grow, a few will find their way out side the ring. Gently bend them and push them back inside. After Paperwhites finish blooming, we recommend that you throw the bulbs out or toss them on the com post pile. They won't bloom again indoors. 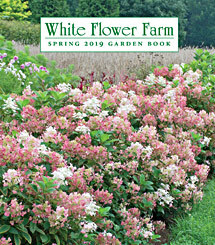 White Flower Farm is your dependable source for Paperwhites, Paperwhite Bulbs, Paperwhite Gifts and Paperwhite Gift Sets.